Dr. Seuss' How the Grinch Stole Christmas is getting another adaptation, this time as an animated feature film entitled The Grinch from Illumination and the minds behind Despicable Me and Sing. Benedict Cumberbatch is playing The Grinch, which is pretty much all you need to know to get excited about heading to the theater on November 9th. That having been said, Funko has unveiled the first figures based on The Grinch, and they are available to pre-order via the links below with shipping slated for October. 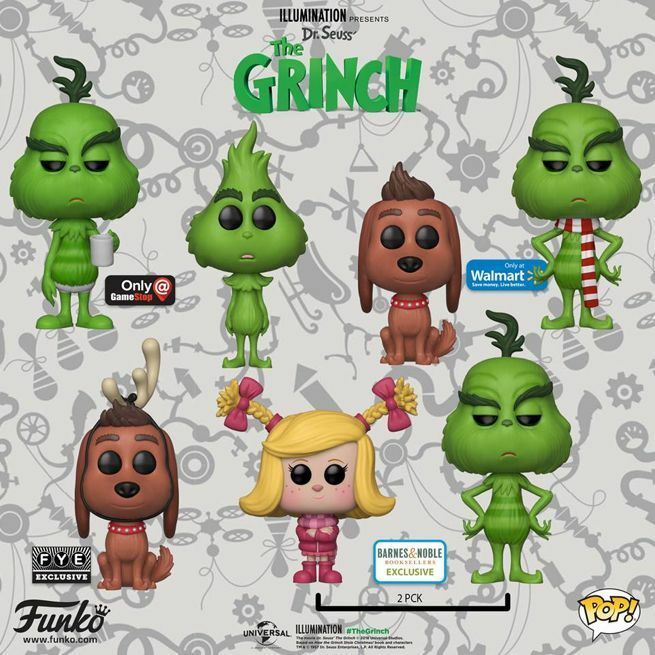 As far as exclusives are concerned, look for a Grinch and Cindy-Lou 2-pack at Barnes & Noble, Grinch with a scarf at Walmart, and Max with antlers at FYE this Fall. "Academy Award® nominee Benedict Cumberbatch lends his voice to the infamous Grinch, who lives a solitary life inside a cave on Mt. Crumpet with only his loyal dog, Max, for company. With a cave rigged with inventions and contraptions for his day-to-day needs, the Grinch only sees his neighbors in Who-ville when he runs out of food. Meanwhile, down in Who-ville, Cindy-Lou Who—a young girl overflowing with holiday cheer—plots with her gang of friends to trap Santa Claus as he makes his Christmas Eve rounds so that she can thank him for help for her overworked single mother. As Christmas approaches, however, her good-natured scheme threatens to collide with the Grinch’s more nefarious one. Will Cindy-Lou achieve her goal of finally meeting Santa Claus? Will the Grinch succeed in silencing the Whos’ holiday cheer once and for all?" 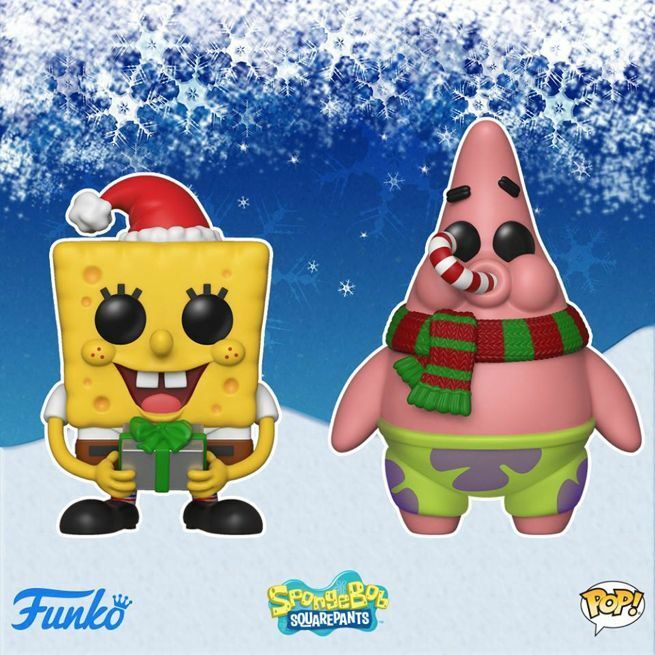 On a related note, Funko has been steadily releasing Christmas-themed Pop figures recently, and there have been three waves to date: Marvel, Star Wars, and SpongeBob Squarepants. 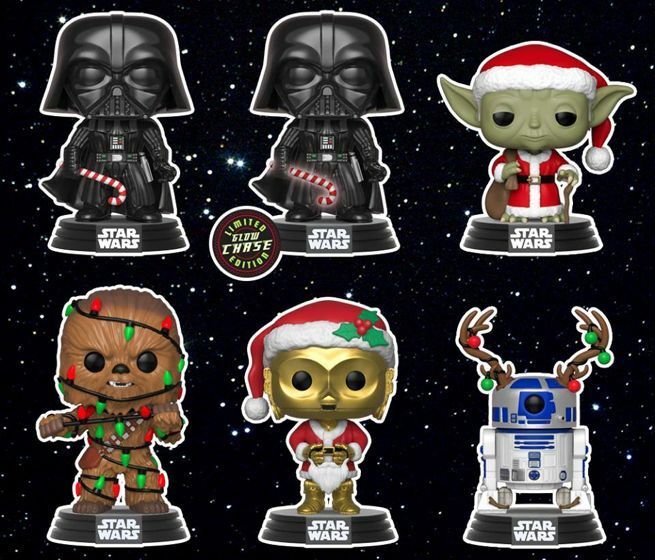 The Star Wars lineup includes versions of Darth Vader, Yoda, Chewbacca, C-3PO, and R2-D2 that are very much into the holiday spirit. You can pre-order each of the Star Wars Pop figures here with shipping slated for October. The SpongeBob SquarePants holiday lineup includes SpongeBob and his buddy Patrick Star. And look, SpongeBob has a gift for you! If it's fruitcake, just make sure to have it analyzed. 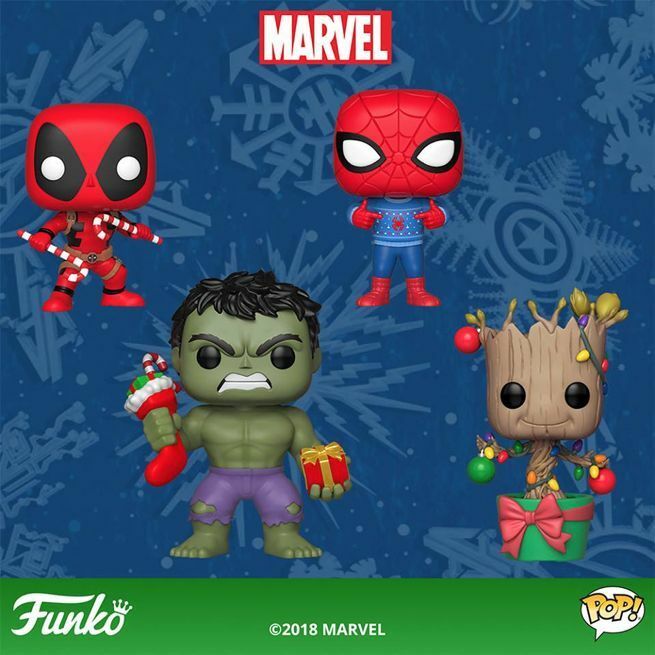 Finally, Funko's Marvel holiday Pop lineup includes Deadpool with candy canes, Spider-Man sporting an ugly sweater, Hulk furiously crushing a stocking (probably because he got a tie instead of a Nintendo Switch), and a Groot Christmas tree that Charlie Brown would be proud of.